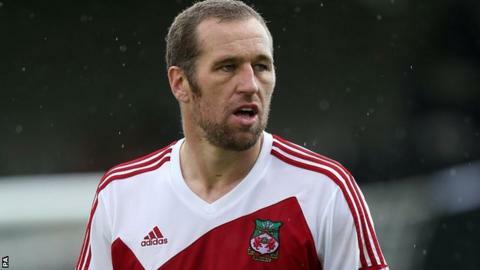 Wrexham manager Kevin Wilkin has released defender David Artell and striker Joe Anyinsah. Johnny Hunt, Mark Carrington, Andy Coughlin, Nick Rushton and Jonathan Royle have been offered new deals. Defender Danny Livesey, who spent the final three months of the season on-loan from Carlisle United, has also been offered a contract. Steve Tomassen and Leon Clowes have verbally agreed new deals with the Conference Premier club. Wilkin has invited midfielder Kevin Thornton, who spent the end of the season on-loan at Tamworth, back for pre-season training. Midfielder Hunt was Wrexham's top scorer while fellow midfielder Carrington was the club's player of the year and goalkeeper Coughlin was voted the young player of the year. Wilkin, who succeeded Andy Morrell as Wrexham manager in March, will hold talks with the remaining squad members on Wednesday. Gibraltar international Artell initially joined Wrexham on-loan during the 2012-2013 season before joining permanently on a one-year deal last September. Former Bristol Rovers striker Anyinsah joined the club on a one-year deal last August and scored four league goals for the Dragons. "Those two that I've let go have applied themselves in a good way and always worked hard for the cause," Wilkin said. "It hasn't quite worked for us as a team and the blame doesn't lie at any individuals' door. "But it's a group responsibility for the indifferent season that we've had. "Everyone to a man within that squad has responded well to me through the course of it and it's not an easy thing to move people along their way. "But it has to be done. It's part and parcel of the job that I'm in and I think those guys accept it and we wish them well in the future."